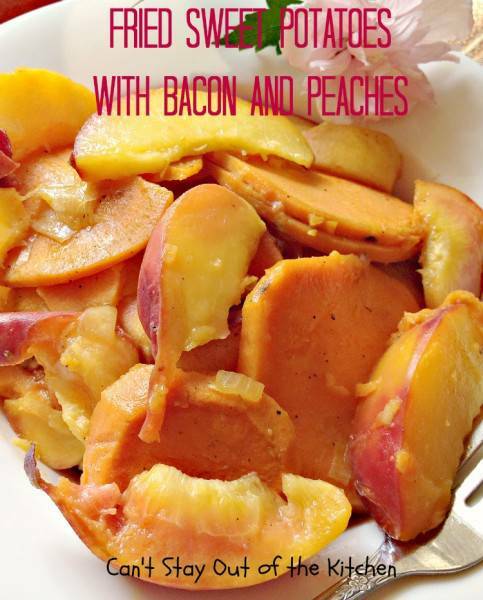 Fried Sweet Potatoes with bacon and Peaches is an awesome way to prepare sweet potatoes. No kidding. Many of you are going to look at the title of this recipe and say: seriously? This turned out to be a really tasty way to serve sweet potatoes–especially for breakfast. I fried a few bacon strips cut in pieces, added sweet potatoes, onions, leeks and peaches, and it was incredibly delightful. 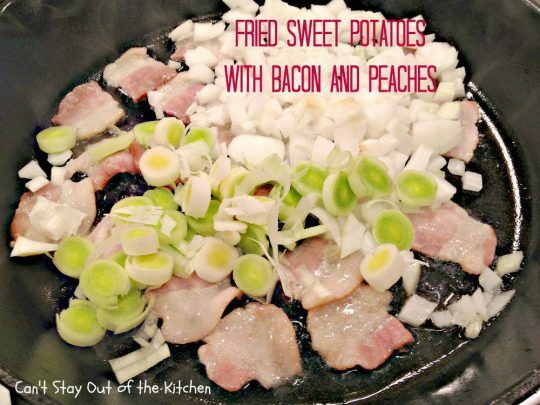 Sweet potatoes and peaches provide a little sweetness, and the bacon, onions and leeks provide a very satisfying and savory goodness to the dish. Many of you know I am constantly looking for ways to add more fruit and veggies into my diet and to eat clean or paleo. I don’t always succeed but I keep trying. 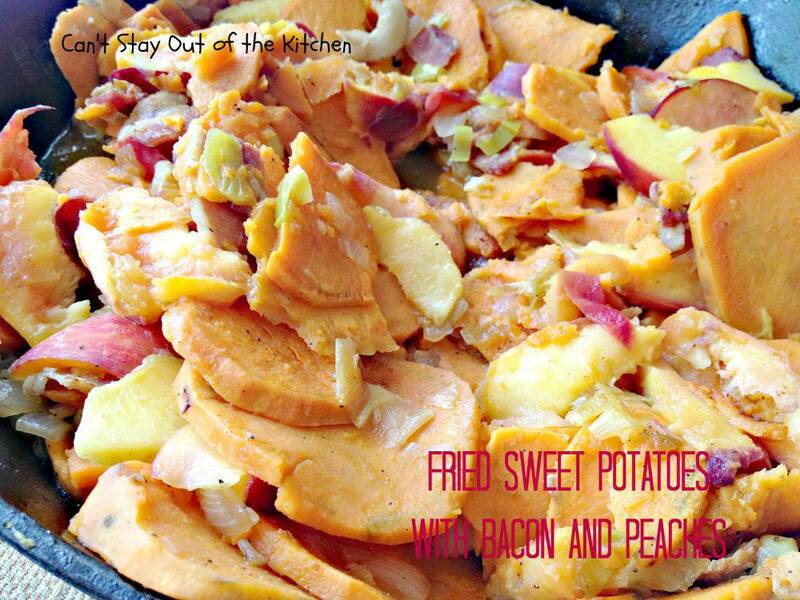 I love sweet potatoes with bacon and cheese, so I decided to try sweet potatoes with bacon and peaches since they are now in season and I can get them easily at the store. 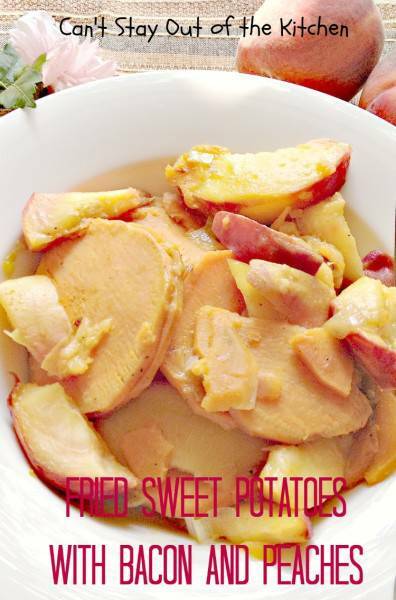 I will tell you that this recipe works a little better with peaches that are not quite ripe and you should also leave the skin on. It’s easier with cutting, prep work, and cooking. 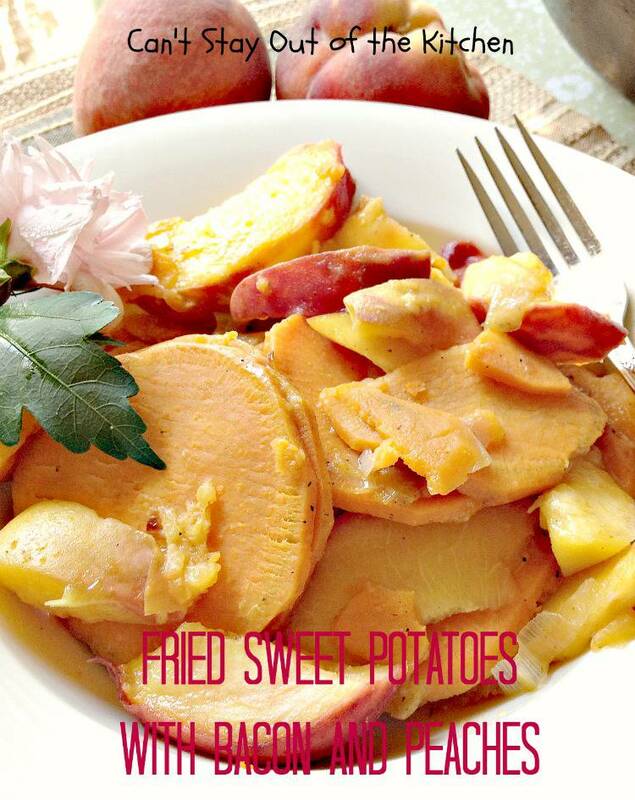 Fried Sweet Potatoes with Bacon and Peaches was an exceptionally flavorsome and delicious breakfast dish. I used two very large sweet potatoes and there was enough for four large servings when I was finished. 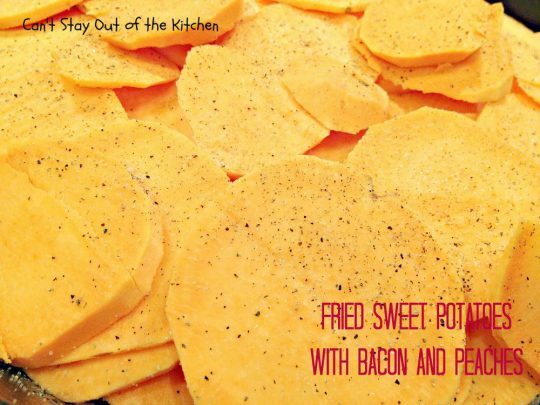 If you’re looking for a new and different way to use sweet potatoes from your garden produce and you’re tired of candied sweet potatoes every time you eat them, then consider this tasty breakfast option. 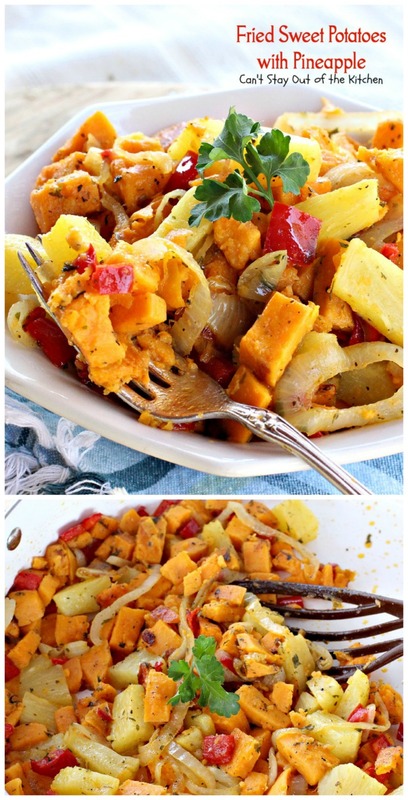 It’s quick and easy and not nearly as high in fat or sugar content as most sweet potato recipes. 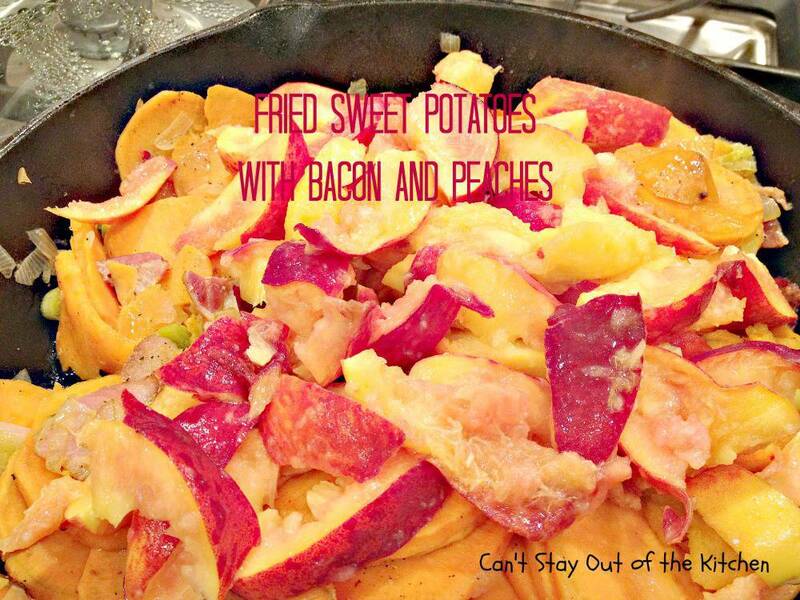 Here’s a look at Fried Sweet Potatoes with Bacon and Peaches. This close up shows the texture of the dish. Fried Sweet Potatoes with Bacon and Peaches is a wonderful breakfast dish. Cut 3 slices of bacon into 1-inch pieces. Place bacon in a large 12-inch cast-iron skillet without oil and saute. Add diced onions and sliced leeks. Stir and saute a few minutes until the bacon renders its fat and cooks crisply. Meanwhile, peel sweet potatoes. 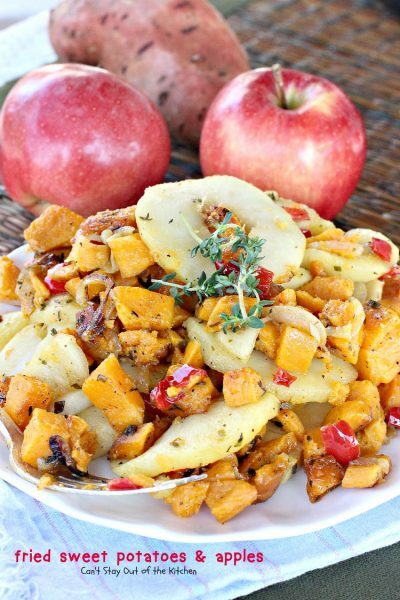 Slice down or chunk potatoes and add potatoes to the skillet. Season generously with salt and pepper. Cover with lid and cook about 20 minutes. Stir every 5 minutes. Add sliced peaches. 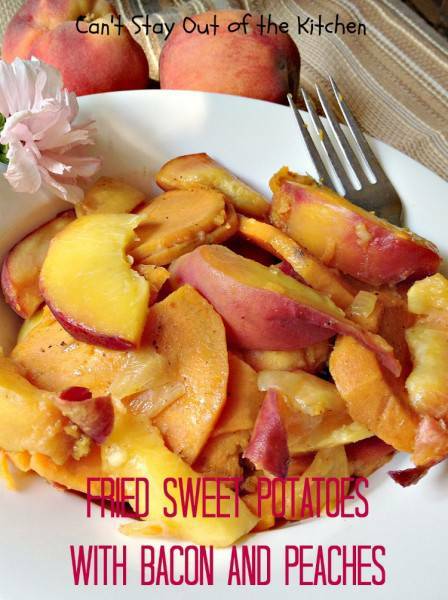 Cover with lid and cook until peaches are cooked through – 5-10 minutes. This works well with peaches that are firmer rather than really ripe peaches. I had a few of both in the skillet. Stir to combine. That pretty flower is from a Rose of Sharon Tree we have out in our front yard. I love to eat breakfast and lunch outside on my patio with fresh flowers. 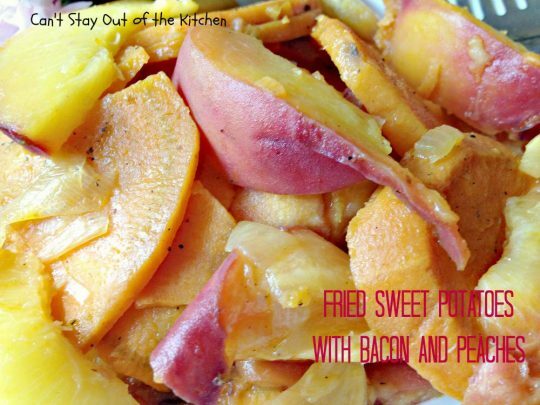 Serve Fried Sweet Potatoes with Bacon and Peaches. If you prefer a stronger bacon flavor than add 3 more slices of bacon. This close up shows the texture of the fruit after it cooks. 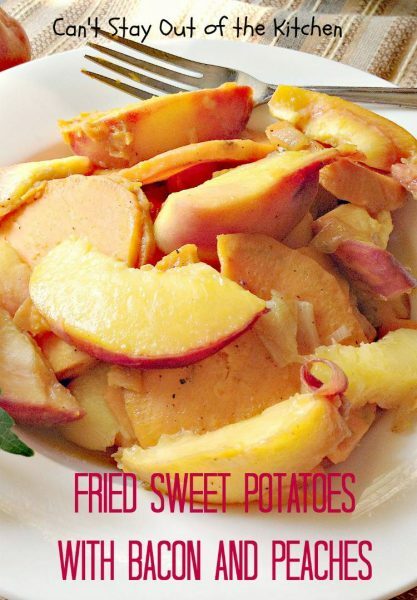 Sweet and savory southern-style side dish or breakfast entree with sweet potatoes, peaches and bacon. Place cast iron skillet over medium heat. Add bacon pieces and sauté. Add onion and leek and cook until bacon is done – about 5 minutes. Cover with lid and sauté about 20 minutes until sweet potatoes are almost cooked through. Add peaches and replace lid. 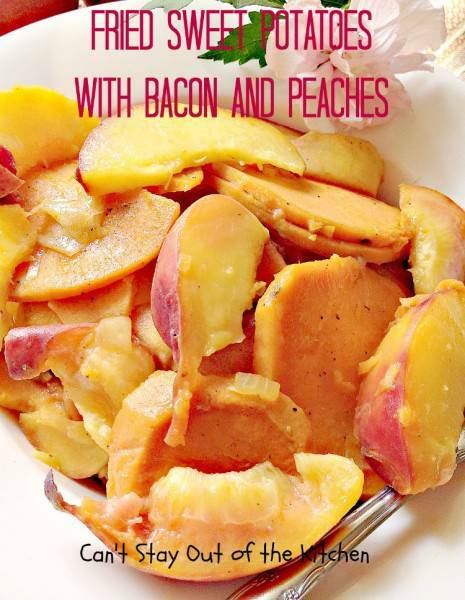 Cook an additional 5-10 minutes or until peaches are cooked through. Fried Sweet Potatoes with Bacon and Peaches is a delightful sweet and savory breakfast dish. I thought it tasted superb! 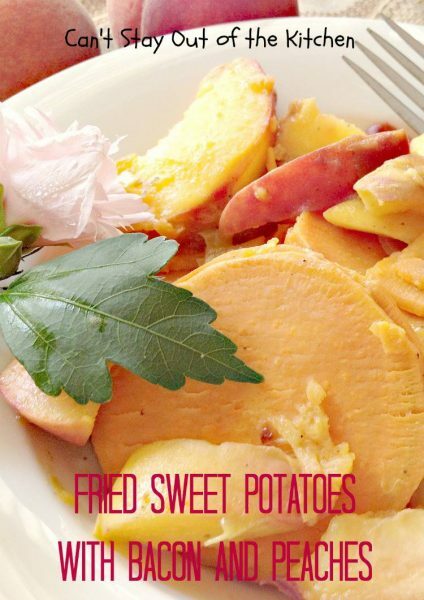 This dish is incredibly easy to make and a great way to use up sweet potatoes or peaches when they are in season. The leeks and onions along with the bacon provide a sumptuous taste to the sweet potatoes and peaches. Try not to leave out the leeks in the recipe. They add SO much flavor. Fried Sweet Potatoes with Bacon and Peaches was one of the tastiest breakfast recipes I have tried this year. 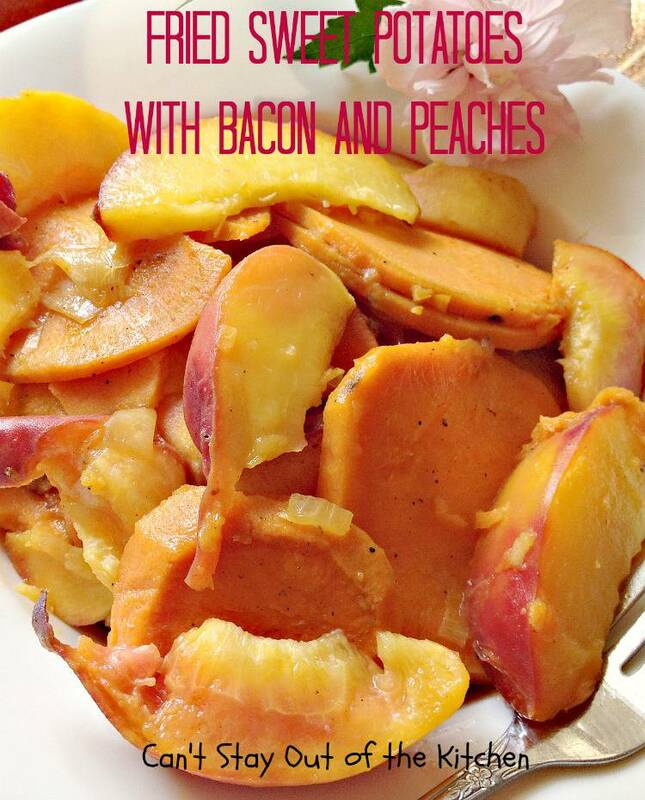 I loved the flavors of sweet potatoes, bacon and peaches together. Yum. I wanted you to have this “Inner Peace Award” for all that you contribute to your blog, your readers, and your kindness towards myself and so many. Hey, Clarissa, this link doesn’t work. This combination actually sounds and looks good — I would never have thought of it, or even thought it would be good. Your pictures and descriptions have made it something I would like to try! It really was very tasty even though it sounds kind of weird! So glad your family is enjoying that recipe. I thought it was superb, too! Love this idea, thanks for the recipe. I am definitely trying this one when our peaches come in season.